Strong vocal harmonies are in vogue if you know where to look. It’s a phenomenon that never went away, despite fluctuations in popular music over the years, and one of the groups making waves is These Guys Worldwide. A cappella groups like Pentatonix and Home Free are enjoying success in epic proportions by blending beat-box sounds to the vocals, while vintage groups like the Oak Ridge Boys still blend those highs and lows despite the years taking its toll on many of their peers. “Jersey Boy” type groups paying homage to Frankie Valli seem to be popping up everywhere. 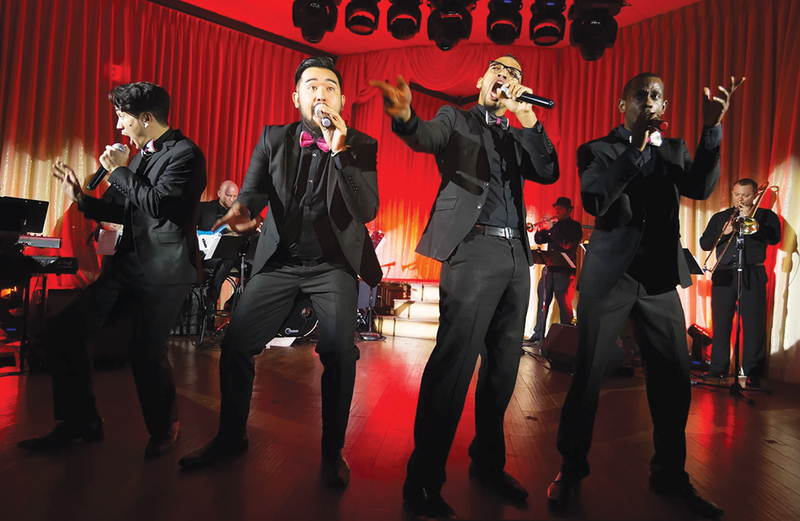 These Guys Worldwide tackle multiple genres, from barbershop to funk, R&B, pop, doo wop, big band, rock, Motown, jazz and soul, taking audiences on a trip around the musical world. Blending their talents, These Guys cover a variety of tunes while bringing their own unique style and energy to every show. They set out to bridge gaps between young and old by meshing timeless classics with popular tunes of today. These Guys include Jazarri (Jazzy) Smith (bass/baritone), Josh Downtain (baritone/bass/vocal percussionist), Erik Carlson (lead/tenor), and Thomas Nanthavongdouangsy (tenor/lead), and they have been together since 2011. They started their journey performing on cruise ships, and now are expanding their talents to the streets. All four have collegiate backgrounds in music and hope to inspire youth to be proud to artistically express themselves. Talk a little bit about your background and how the group came to be? Well, Josh Downtain, who does most of our a capella arrangements, started this group back in 2004 with some of his friends under the name “These Guys.” The name came about because, while in college, they sang in an all-male a capella group and they didn’t like it much. They didn’t care for the leader’s song choices or anything, so they decided to make their own group. They didn’t want to be associated with “those guys” so they named themselves “These Guys.” It was just that simple. The “Worldwide” in our name didn’t come until much later after we had been traveling around the entire world for years and we needed a distinction from the old version of the group. The details about how this particular four came together will be further explained during the show, so stay tuned for that. How long has this group of guys been together and what has been the response to your show? This exact group of four guys has been together for the last eight years. The response to the show is always great. People are always a bit surprised at the amount of energy we have on stage and the eclectic variety of songs we sing. Talk a little about each guy and what they bring to the table? Josh arranges our a cappella. He is the “ear” of the group. He sings baritone, which tends to be the hardest part to sing in harmony. Although very calm in person, he is a huge ball of energy on stage. He has competed in many barbershop competitions so his passion is for making harmony. He also is our vocal percussionist on a capella songs and shares the emcee role with Jazzy. Thomas is our rock star. He switches back and forth from singing lead and tenor along with Erik. He has a musical theatre background so he is all about comedic antics and drama. You never know what to expect when Thomas is on the stage — he can be a bit wild. He has been known to give ladies lap dances in the middle of a song. He sings lead on all of our rock songs and he can really belt out some mean high notes. Erik is our pop star. He serenades crowds with his smooth falsetto and charm. He sings tenor and lead with Thomas. He has been singing since he was 6, so performing is very, very natural for him. Expect passion and love from him on stage — you will be able to see how heartfelt each moment is for him by the way he moves and sings. He tends to lead most of the pop and R&B songs. I’m the creator of the show. I make the song selections, help to build the charts and concepts, design the lighting, and facilitate all the miscellaneous tasks that the group needs done. I sing bass, which is the very lowest part to sing. I share the emcee role with Josh and he loves to go off-script with the crowd, as he is pretty quick on his feet with jokes and comedic antics. I am a lover of jazz music, hence the name “Jazzy” so you can expect to hear some jazz influence in my voice stylistically. Are you guys totally a cappella? No we are not. At one point, we were just singing a cappella, but we added an orchestra to our shows a very long time ago so now we consider ourselves “a highly energetic vocal group” with a cappella being one of the things we do as opposed to the only thing we do. We love to dance, and you can’t dance as much when you sing a cappella, so our sets include both a cappella and songs backed by a live orchestra. Talk about the music you perform? We do every genre we can fit in. All four of us have unique and distinctive voices that cater to different genres of music, so we use that to our advantage. It’s great to have that versatility, as it allows us to authentically pay tribute to a variety of legendary groups. We will do rock, funk, jazz, R&B, pop, doo wop and barbershop. Is the musical genre of R&B dying? We don’t know, all we can say is it isn’t dead for us and our audiences love it so it isn’t dead for them — and we perform for many different demographics of people (ages, cultures, etc). Everyone still likes it because there is a certain undeniable feeling in the soul that it creates — we feel it, we imagine our audiences feel it as well. How do you go about choosing the songs you perform? Does everyone in the group participate in the process? I do all this work. However, if by the rare chance one of the group members is a bit ill, songs can be switched out or moved around at anyone’s discretion. What was the most challenging part of putting this group together? Well it takes a lot of time to understand each other on stage. In order to do this, you have to understand each other off stage. Once we learned about each other and created a true brotherhood amongst ourselves, coming together on stage was very natural and easy. So we had to hang out a lot to build chemistry and friendship and rehearse quite a bit to make sure we knew our stuff well. So in the beginning there was quite a bit of rehearsal days and quite a bit of drinking nights as well. There are other singing groups and Jersey Boys groups. What sets you guy apart? When we first started cruising back in 2009, we had to audition with the material of “The Jersey Boys.” We sing their music now, not to be like anyone else, but because it reminds us of how we first started singing professionally. It is more of a sentimental choice rather than anything else. The crowd tends to have sentimental attachments to “The Jersey Boys” music as well, so they usually feel the same way we do about it. Our rendition of their music is unique simply because it’s us doing it. With our personality, approach to the harmonies, and the slight funkiness articulated in the band charts, it will feel fresh enough to keep you interested and familiar enough to walk down memory lane as you sing along. We were invited to sing the theme song for an a cappella competition show that aired for a few years on NBC called “The Sing-Off.” It was a huge honor to do this and was really cool to hear our voices on a national TV show. Talk about the show you’re bringing to the Tropicana Laughlin. What’s in store? It’s high energy and dancing, of course. There will be moments where we are in full choreography and then other moments where we are just partying. It is a very fast-paced show, so be prepared to dance the whole time. We will keep you moving, that’s for sure. We bring smooth harmonies. Since we started off as an a cappella group, even when we add the band, we still have the same love and attention to harmony. There’s comedy. We don’t take ourselves seriously — we are there to be human beings, not robots. So expect the unexpected as we don’t even plan every single detail, we let ourselves naturally interact with the crowd and we have a lot fun doing it. This way, no show ends up being the exact same and the audience can tell they have been part of a moment that will never happen again. We can get pretty silly so who knows what you will see, but we are sure you’ll be smiling about it. Do you want to talk about a show highlight without giving away any surprises? We won’t say anything specifically, but we will give you some clues on what you’ll see… We will wear wigs at some point. Somebody in the audience will most likely receive a lap dance. We will be drenched with sweat by the second song because that’s how intense this show is. There will be crowd participation so all the fun people sit up front please. At some point in the show, we guarantee you will laugh, you will want to dance, and you will sing along. Anything else you would like people to know about your group? Come in to the theater with an open mind and open heart. No inhibitions allowed. We want you to feel free to get up and dance and sing and make noise and laugh and do whatever the music makes you feel like doing without worrying about the other audience members. There is healing in a good time, and that’s exactly what we are bringing, a good time. We know that everybody is going through something, so we want our show to be a vacation away from your troubles. There is a little something for each and every single person that comes, we promise. Bring your good energy and dancing shoes and we will celebrate life with you. See you on the dance floor, party people.